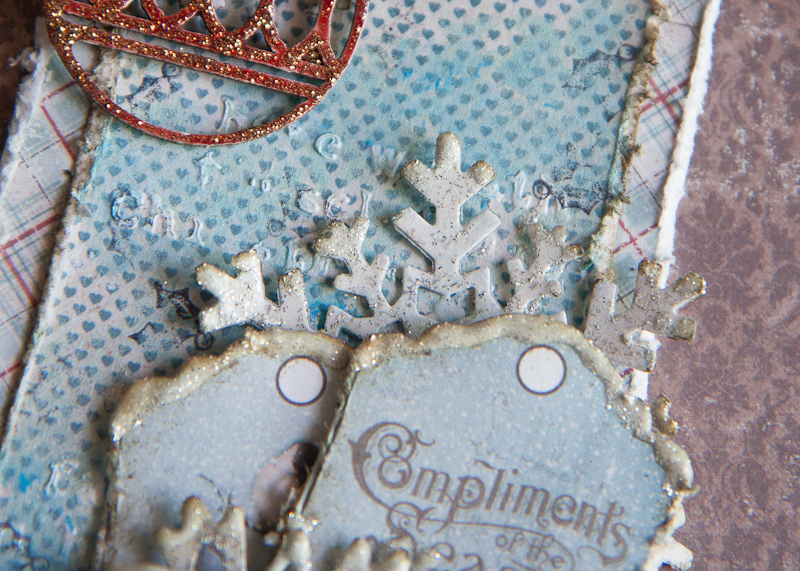 I’m in today to share a Christmas project for Maja Design. I’m not much for Christmas papers as you would know by now, but their “Home for the Holidays” collection is absolutely delightful! For this month of December, I will be creating with this collection just to get into the festive cheer. 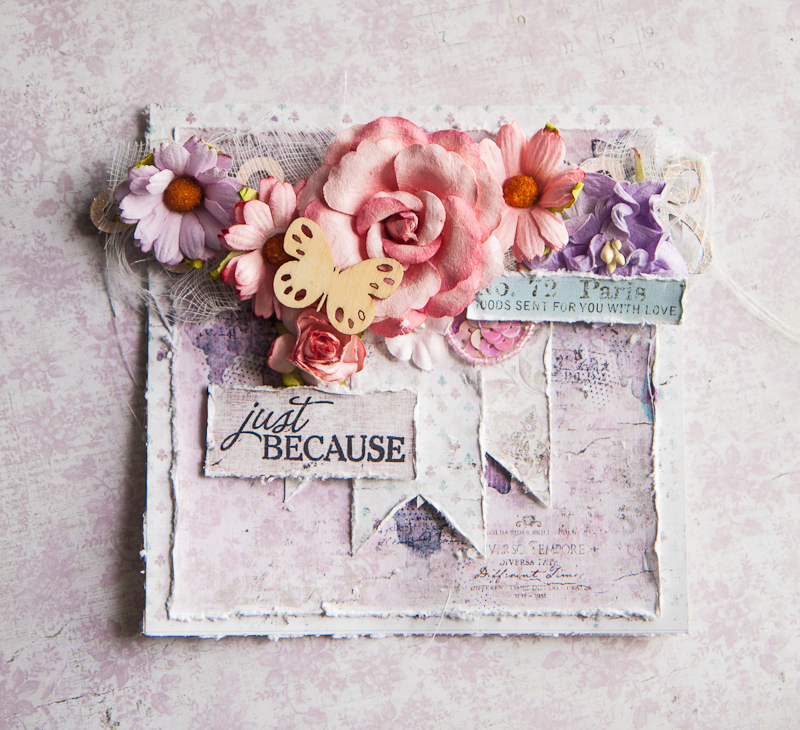 I’ve done some layering of papers from the 6×6 paper pad, as well as with the die cut tags and postal stamps. Again, my background work was simple – with some festive words stenciled with modeling paste and colored over with a matching blue in watercolor and paint. 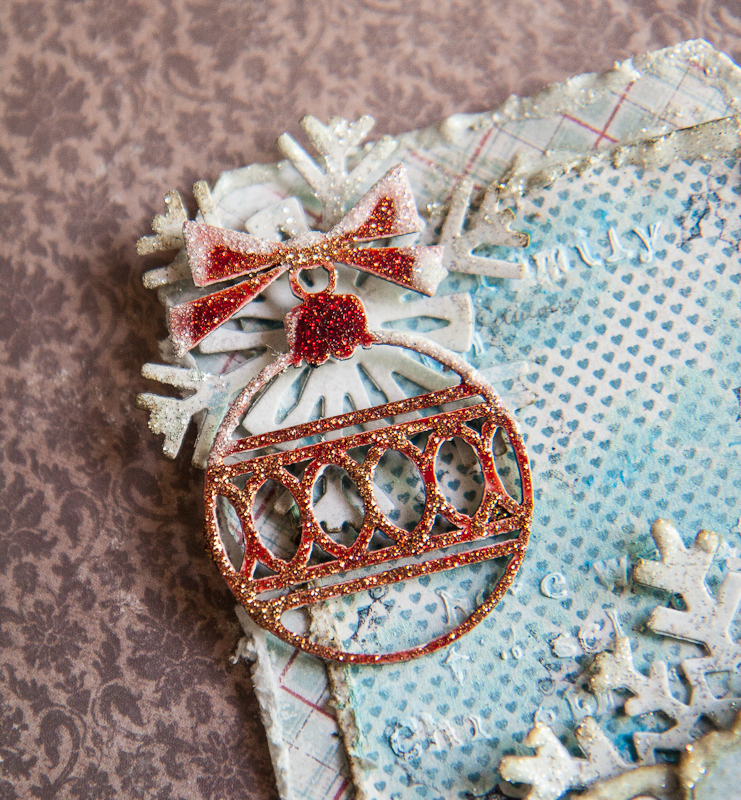 A chipboard ornament which I colored with glitter ink and stacked on top of a die cut snowflake from one of the more neutral colored papers from the paper pad. I chose red to highlight the color in the bottom-most piece of patterned paper and to use it as an accent color that really popped. 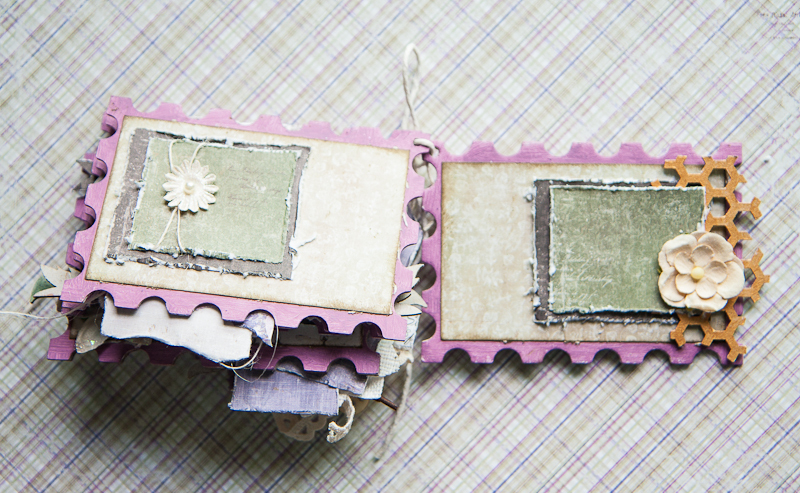 Layering of the tags which I fussy cut out. 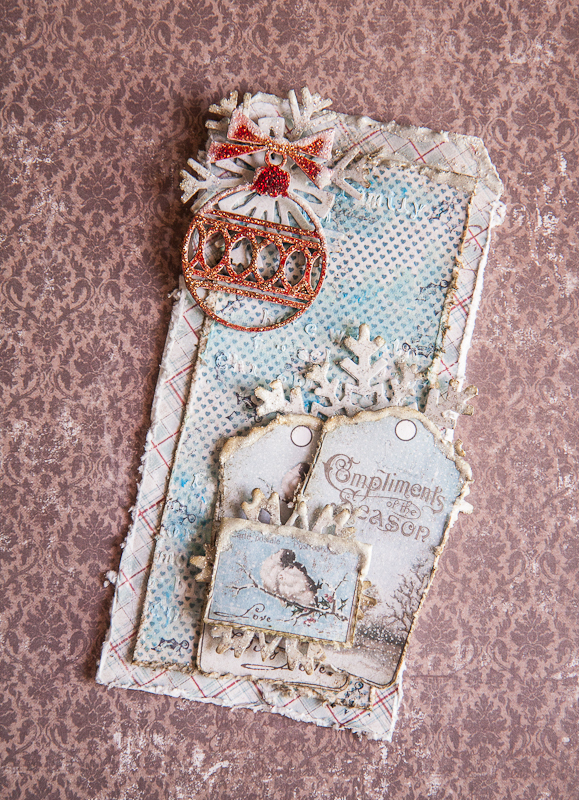 To create the snow falling on the tags, I added generous amounts of white glitter paint and allowed it to dry. This postage stamp really warms my heart! It reminds me of exactly what we do in cold weather with our loved ones – we cuddle! That’s all I have for today. Have a great day ahead! I’m finally able to share a layout I made of my little girl – it took awhile to get those photos printed! 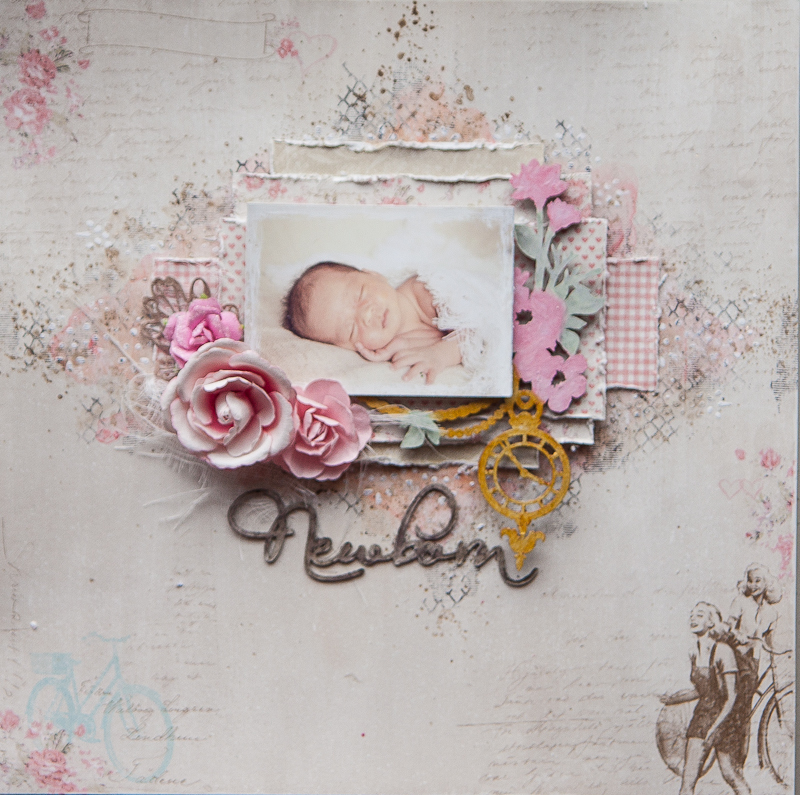 I was very tempted to use the Vintage Baby collection, but thought I would have a bit of fun with a collection that’s not baby-based. I choose this particular sheet “Off to meet him” as the background color matches my photo’s perfectly. I also liked how Marie has drawn the images such that my photo and clusters can be placed in the centre without being too cliche or flat. My background is very simple painting with pink and brown, and I had added my stenciled lace after the painting so that I get a nice contrast of white against the colors. Usually my stenciled designs get lost in the colors I add so this is one way of letting them stand out. 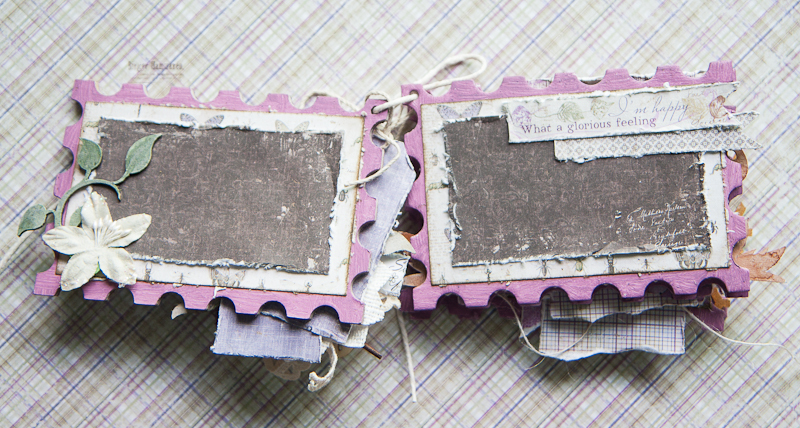 My layers of papers, made from scraps from the same collection. I also have a piece of chipboard which I tucked in between and colored with various dimensional and distress paints. My floral cluster to make it more feminine. 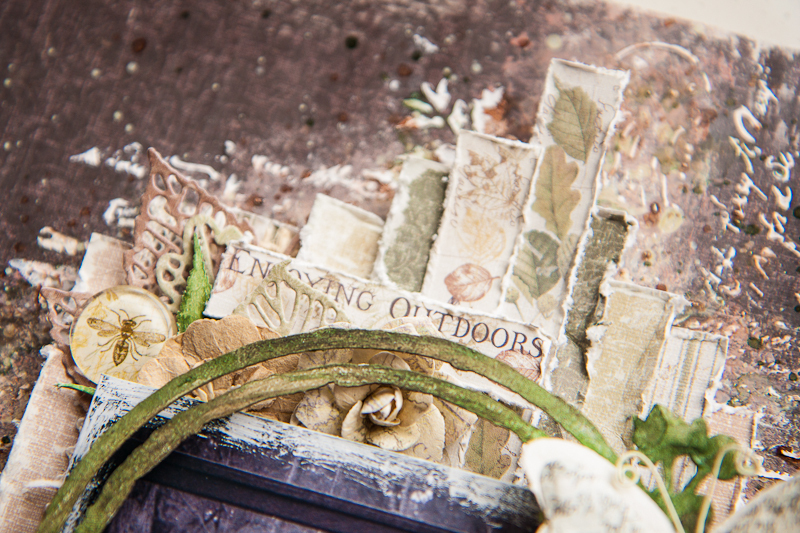 Underneath is a spare die cut leaf which I had from a previous project made with Enjoying Outdoors. And my title which I had colored with gelato and watercolor pencil to match that of the ladies in the corner. And that’s all I have for today. Thanks for dropping by the blog! 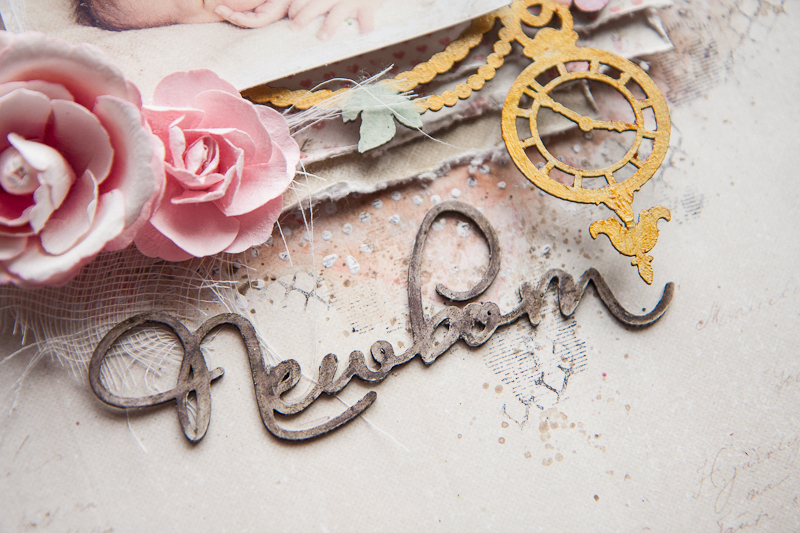 Hello friends, I’m back on the Maja Design blog again today with a simple card to share with you. Don’t be surprised, even in a small simple card there are design principles you can follow to make your card visually more pleasing to the eye. When layering my papers, I like to alternate between a neutral shade like grey, off-white or beige and what I like to call a “character color”. Basically, it’s the color that sets the theme and feel of the project and gives it its “character”. 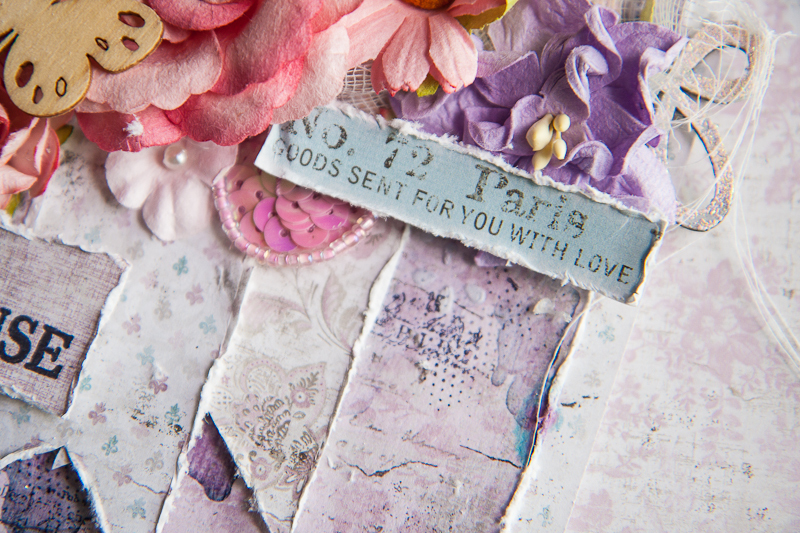 In the case of this card, my “character color” is the soft purple with tinges of pink and it has given the card a romantic and feminine hue as it is going out to a very special lady. So following this guide, I alternated off-white with purple, and on the purple itself, varying between intricate designs like paisley swirls and simpler mini fleur di lis. The contrast between these elements lends a lot of dimension and pleasure to our eyes. I stamped on my sentiment on a solid purple background and juxtaposed it next to the banner with more off-white so that it’s obvious it’s the message I want to send to my recipient. The banners were arranged to form an inverted triangle with the floral cluster, so that gives the visual flow of the card. A little bit of the background mediums work: stenciling, painting and some stamping. 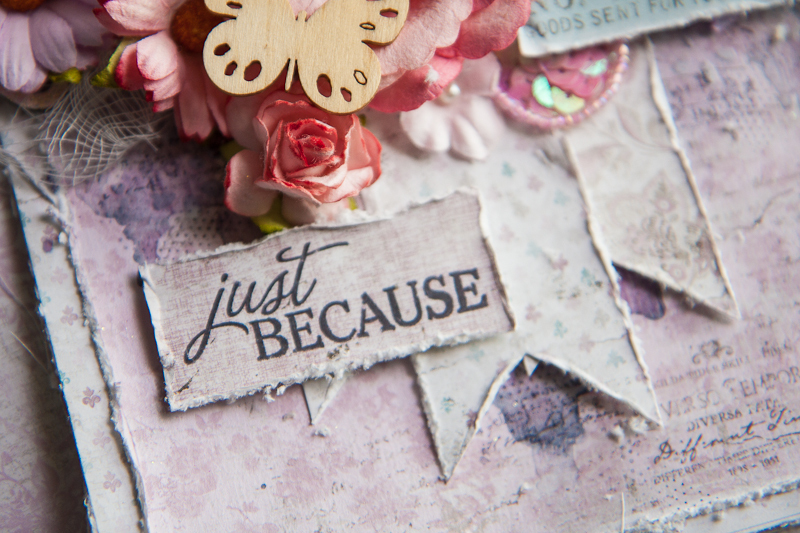 I used a lace border stencil for a more feminine touch, and a little splash of blue just to create a color accent. I also placed the cut-out from the info strip diagonally across my sentiment for a smooth visual flow as that is the direction our eyes would follow when reading from one line to the next. 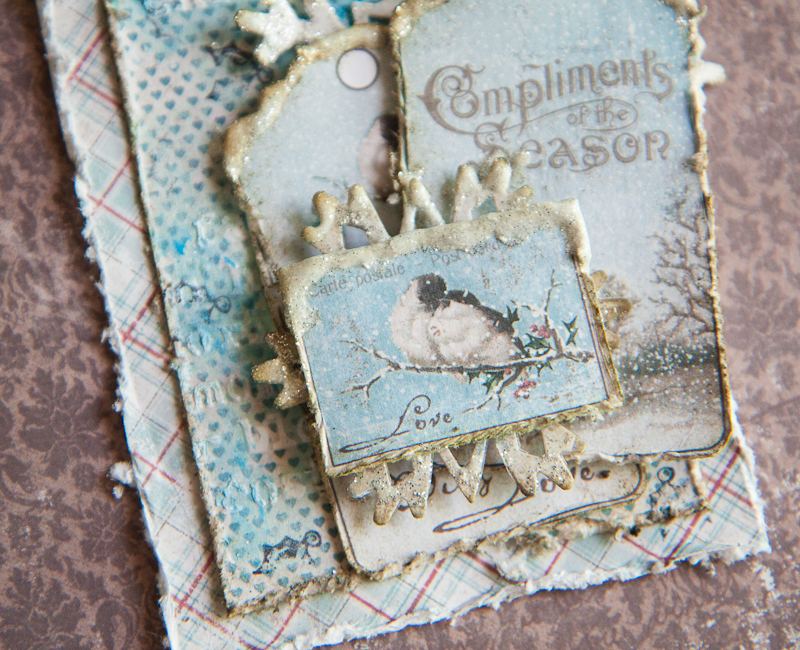 My chipboard was altered with simple heat embossing. Well I hope these guidelines are useful for you when thinking about creating your next project. Until then, happy crafting! 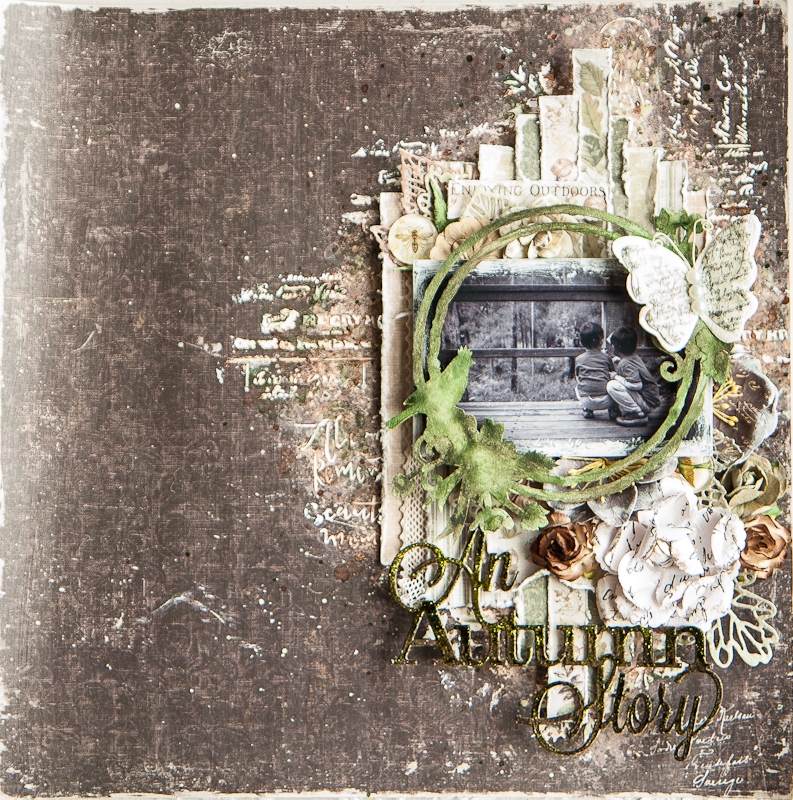 Today I’m up on the blog with another layout I created using the Enjoying Outdoors collection. This time, I focused on the rich greens and browns of the papers and used it for a trip we took in the forest during autumn. We were on a broad walk in the middle of an age-old forest of karri trees and there was a little lookout by the side. Being boys, my two sons ran up the lookout and were surprised to find a little star badge on one of the wooden beams. They went on to make up their own story about how it got there and a new adventure was created. I love it that they are so creative and curious in their own ways about the world around them, and that there is always a story (pretend or not) to everything they see. My paper layers, which I made into a vertical line to imitate the towering trees in the Valley of the Giants, a very ancient karri tree forest. By alternating the different shades of brown and green, and with the patterns in the info strip, I was able to add a lot of contrast and details. 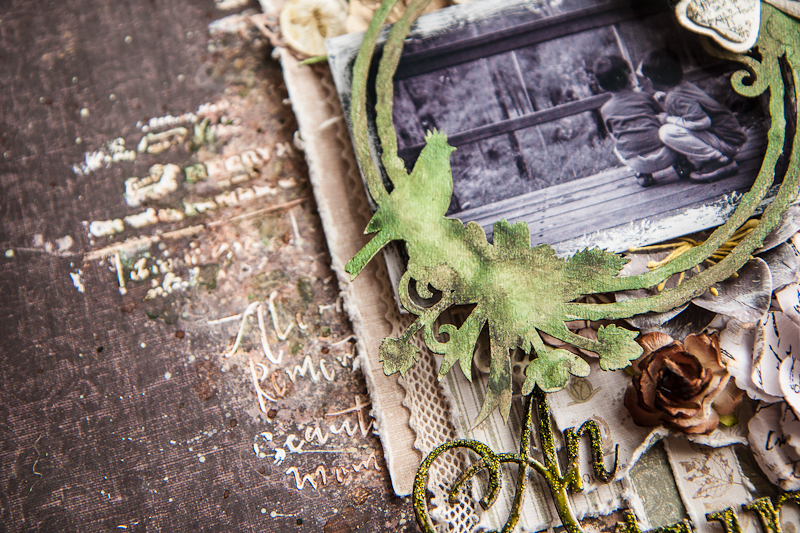 My chipboard was embossed in brown, and I painted green glitter paint over. 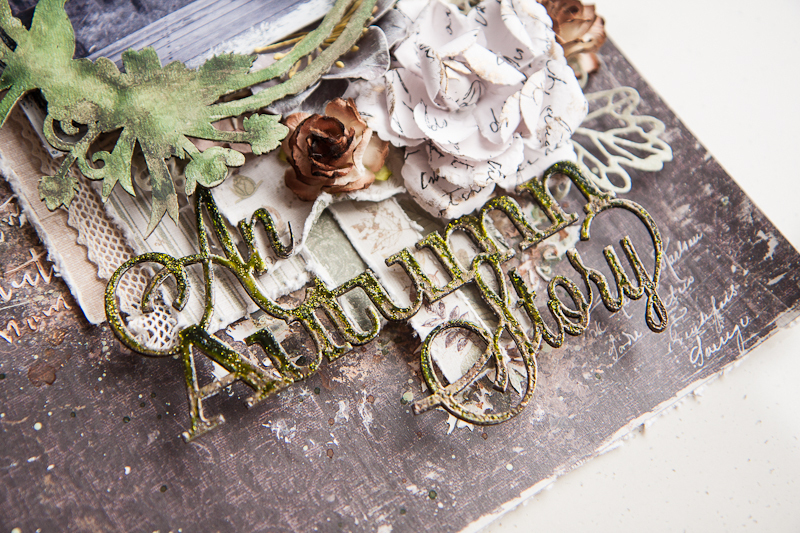 Adding more details with the die cut leaves and words from the info strip. A simple background of stenciling words and sprinkling of paints. 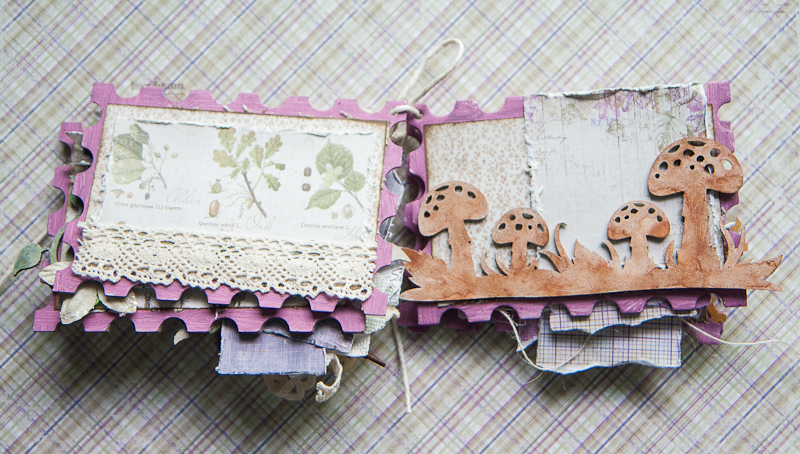 My chipboard frame was painted with watercolors and I also had lace and hessian tucked into the paper layers. That’s all I have for today. Thanks for dropping by! I’m on the blog today to share a mini album I’ve made from the brand new collection Enjoying Outdoors. I love the sweet combination of purples with browns and greens – and reminds me of the lavender fields we saw while on a road trip to the forests in Western Australia. Here is the cover of my mini. I love the stalks of lavender in the die-cut sheet but lavenders don’t grow well here, so I tied a small bunch of dried forget-me-nots (I keep lots of these whenever I receive a bouquet of flowers, which is not very often by the way!) with some lace. The die cut tags from the 6×6 paper stack are the perfect size for the mini too. 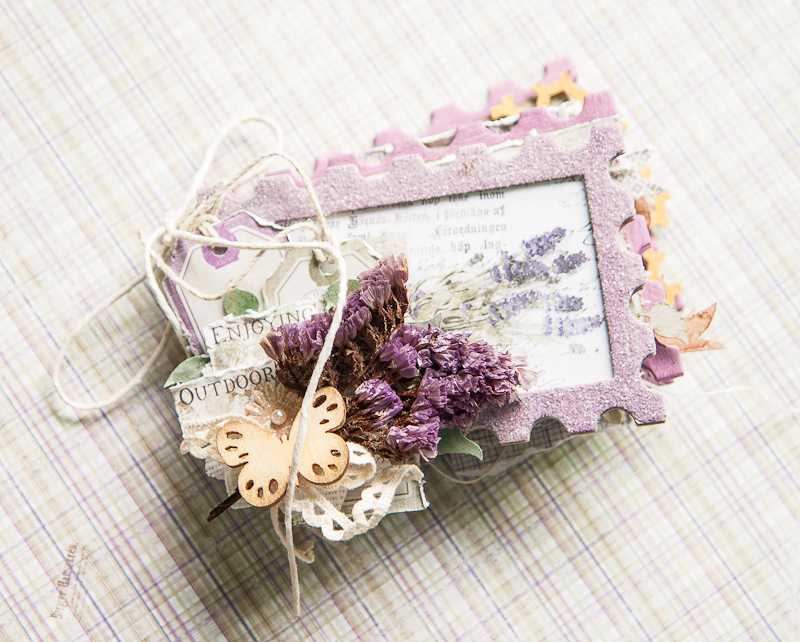 This is really a very small album – about 3″ by 5″ so I decided to keep things simple inside without excessive layers. 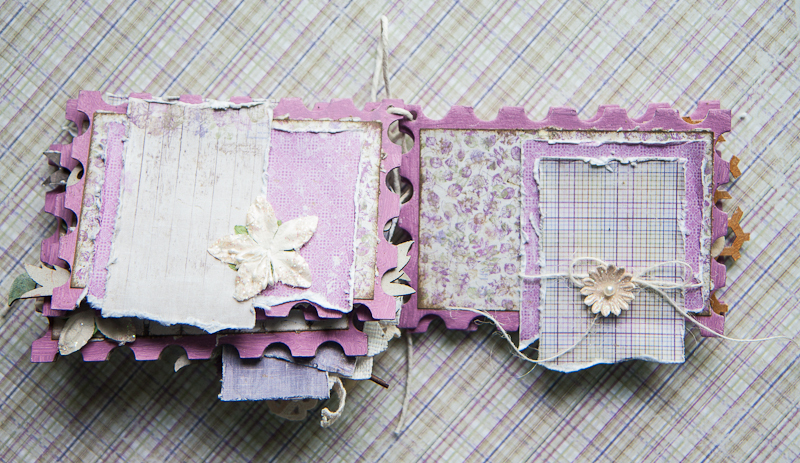 Just lightly distressed edges on the papers and banners made from the info strip to give me plenty of space for photos and journaling. 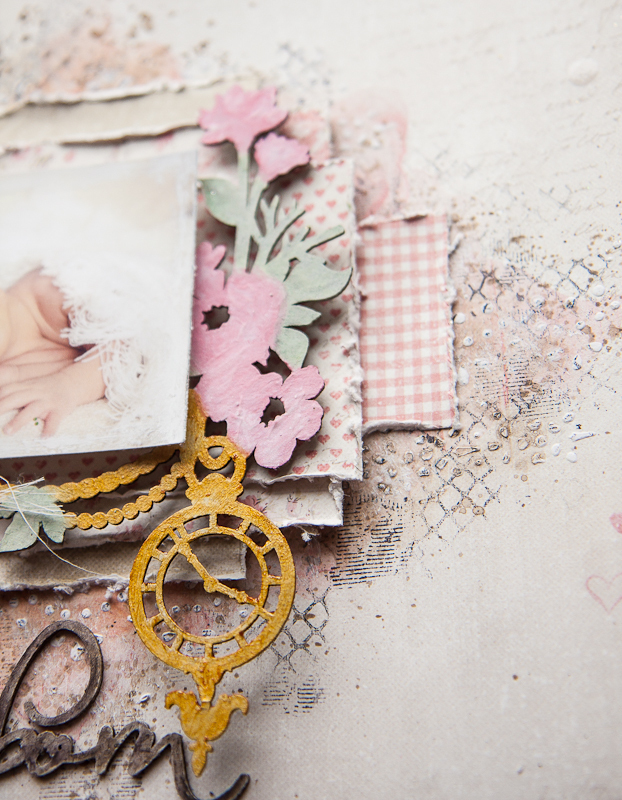 A little more fun here with chipboard and lace. We always try to spot mushrooms on our walks in the park so I added those as a reminder of the little bits of nature we see when we’re outdoors. Now if only there were truffles here…. In the end, I couldn’t resist adding more layers and flowers. 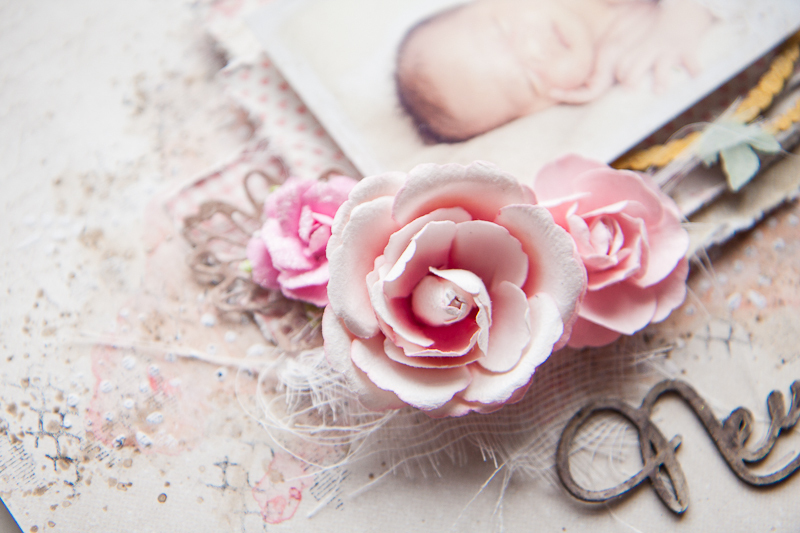 And the last two pages of the album with simple photo mats and flat flowers so that the album doesn’t end up too chunky. That’s all for the mini album and I hope to fill it up soon with pictures of our family out in the parks for our walks and the fun things that we see on the way!